A Saudi-funded Islamic school says it is removing from text books controversial passages which allegedly brand other faiths as "worthless". The head of the King Fahad Academy in west London said pupils had never been taught from the chapters in question but that they would be removed. An ex-teacher claims pupils were taught from books which describe Jews as "repugnant" and Christians as "pigs". The head insisted pupils were never taught religious hatred or intolerance. But the passages would be removed "in the public interest", she said. King Fahad Academy director Dr Sumaya Aluyusuf said the academy promoted "inter-culturalism and inter-faith awareness". She admitted the textbooks - translated for BBC Two's Newsnight programme by two independent scholars - were kept at the school. But the translations were "taken out of context" and had "lost some of their meaning", she said. She said the controversy had arisen from the misinterpretation of the material which was based on the Koran. "I would like to make it clear that the controversial pages within the books are not taught within the academy," she said. "However, in view of the public interest I have decided to remove those chapters from the books. "The school is currently moving towards an international curriculum and new books are being developed for that curriculum." She said pupils and parents had suffered discrimination and intimidation as a result of the controversy. One local shop had put up a sign saying pupils from the school were not welcome and a passer-by had shouted abuse at a parent waiting outside the school gate. "The local MP called me and said he was very concerned about the safety of the children and asked if we would like him to send extra police around the area. "The safety of staff, children and parents is the highest priority for us," she said. 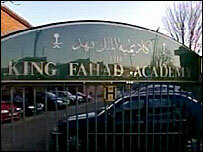 Allegations about the Arabic books emerged when a former teacher accused the King Fahad Academy of institutional racism. A British Muslim teacher started a case for unfair dismissal, complaining that he was made to suffer for whistle-blowing allegations of cheating at exams, and suffered discrimination as a non-Saudi. The school denies the allegations and maintains that the teacher was rightly dismissed for misconduct. About 600 children, aged five to 18, attend the King Fahad Academy private school which receives more than £4m from the Saudi royal family each year. The controversy centres on the use of textbooks produced by the Saudi Ministry of Education. A textbook dated 2005/2006 allegedly asks the reader to "give examples of worthless religions... such as Judaism, Christianity, idol worship and others". The book also allegedly asks the reader to "explain that those who die without adhering to Islam will go to hellfire". In another textbook for 12 and 13 year olds, dated 2004/2005, the author allegedly says that a Koranic verse, which talks of turning people into monkeys and pigs, is about Jews and Christians. The author quotes an early Islamic scholar as saying: "The monkeys are the Jews. And the pigs, they are the Christian infidels at Jesus's table." Ofsted inspected the school last spring and concluded it provided a good Islamic education and knowledge about British institutions and citizenship. It noted that the school did not completely meet regulatory requirements, although no issues about alleged intolerance were identified. Ofsted told BBC News its inspection team included a Muslim Arabic speaker but that not all textbooks would have been examined.